When it comes to sports and music collectibles the signature is everything. You have to be able to rely on the authenticity of your autographed memorabilia. We ensure you can. If you're lucky you'll leave a day at the races with two things: money and memories. The money's likely to vanish pretty quickly but the memories will stay - especially when you capture them with horse racing memorabilia. For the enthusiast, horse racing memorabilia helps you celebrate the legendary pairings of horse and jockey. For the more casual follower, horse racing collectibles help you celebrate the day you took on the Bookies - and won. From retired greats to today's champions on the flat and over jumps, horse racing memorabilia gets you closer to your racing heroes. A celebration of a single race, or as part of a collection, signed horse racing memorabilia makes it personal. Autographed horse racing collectibles can also make a valuable investment and prove a popular choice at charity auction events. If it isn't authentic it doesn't count. We're committed to authenticity and passionate about ensuring all our horse racing collectibles are genuine. 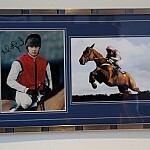 Our expert framing service will transform your autographed horse racing collectible into a brilliant display piece. And we're committed to keeping our prices low, so every fan has a chance to own a perfect piece of horse racing memorabilia, without having to back a winner first.